One of the most exclusive oceanfront residences in all of South Florida is located right here in Boca Raton. One Thousand Ocean offers ultra-luxury modern living at its absolute finest. The building is an architectural masterpiece featuring a curved nautilus shape that is as bold as it is graceful. 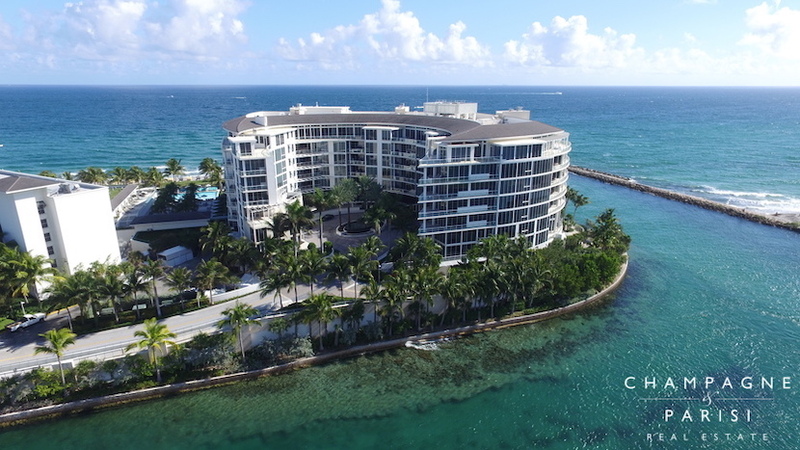 Located on the majestic peninsula of the Boca Inlet, the unique wraparound design of the building provides unobstructed panoramic views of the Atlantic Ocean, Intracoastal Waterway, Boca Inlet, & the nearby Boca Beach Club. The ultra-exclusive private residences at One Thousand Ocean range in price from approximately $4 million to more than $15 million. Available floor plans include two- to five-bedroom single- and multi-story beach villas, condos, and penthouse units. One Thousand Ocean residences range in size from 2,800 to over 8,000 square feet of opulent living space, with each residence also offering expansive private terraces up to 1,200 square feet in size. Each of the artfully designed units at One Thousand Ocean offers sleek, modern design combined with light, open living spaces, and an airy feel which combine to create the ideal private sanctuary. Features include private elevator entry to each unit, floor to ceiling gallery windows, high ceilings ranging from 10-14 ft in the condominium and penthouse residences, and up to 20 ft in the beach villas. Residences also have marble flooring, fireplaces, and multiple balconies with unparalleled views. The spacious private terraces are accessible from nearly every room, many of which offer a private heated swimming pool, outdoor kitchen, and cypress wood ceilings. One Thousand Ocean residences feature chef-inspired, gourmet kitchens with custom Italian cabinetry, stone countertops, Dornbracht polished chrome fixtures, and state-of-the-art appliances. Appliances include a Sub-Zero refrigerator with wine storage, Wolf natural gas ranges, ovens, microwaves, and warming drawers, as well as Julien sinks and Miele dishwashers. Some of the residences also offer separate butler’s pantries. The Master suites at One Thousand Ocean boast spacious his and hers dressing rooms with vanity dressers, Sub-Zero late night snack refrigerators and freezer, and elaborate custom millwork. Master bathrooms include large showers and whirlpool spa tubs and fine appointments of marble and exotic stone. One Thousand Ocean is a full-service building with five-star, resort-style services including manned gated security, onsite management, and valet parking. 24-hour concierge caters to every need from assisting with event ticket purchases and restaurant reservations to helping with shopping, errands, drycleaning, and housekeeping. The Ocean Club includes state-of-the-art, 24-hour fitness center featuring Drive Fitness equipment. The fitness center offers Pilates, yoga and aerobics rooms, cardio and weight training areas, circuit-training, Kinesis Wall. There is also his and her hot tubs, steam rooms, and saunas, as well as a luxurious spa treatment suite. The Ocean Club also features a spectacular oceanfront pool and sundeck which are staffed with poolside attendants. The lakefront clubroom has a full catering kitchen, conference room with teleconference equipment, flat screen monitor, and wireless internet access. There is even a charming social room where residents can relax and unwind, with a large television, extensive movie library, and a video gaming console. One Thousand Ocean also offers a two-level, secure parking garage, located below the building which houses one- to three-car private enclosed garages for each residence. Residents also can purchase a private beach cabana equipped with a bathroom, refrigerator, bar, flat screen TV as well as phone and the internet. Private climate-controlled storage spaces are also available for purchase. One Thousand Ocean is a pet-friendly building, and residents can lease their units with restrictions. Residents of One Thousand Ocean can enjoy Premier Club membership at the nearby Boca Raton Resort and Beach Club, a Waldorf Astoria property. The Resort was recently renovated and redesigned by Thierry Despont and the Beach Club by Andree Putman. The exclusive amenities of this world-famous 350-acre resort include two championship golf courses with a clubhouse, pro shop and professional instruction available, thirty award-winning Har-Tru tennis courts with tennis concierge and pro shop, and access to Spa Palazzo, the 40,000 square foot European-inspired spa with an extensive menu of services and 44 treatment rooms. Resort membership also grants access to several world-famous fine dining restaurants, three resort-style oceanfront swimming pools, a marina accommodating yachts up to 175 feet, and a half mile private beach featuring water sports such as jet-skiing and kayaking. Private event facilities, catering services, and event planning for functions are also available. One Thousand Ocean, named for its address, is located at 1000 S Ocean Blvd, Boca Raton, FL 33432. This private collection of oceanfront residences is positioned on the Boca Inlet peninsula creating a unique and secluded community offering the epitome exclusive luxury, resort-style living. One Thousand Ocean is within walking distance to the prestigious Boca Beach Club and the world-renowned Boca Raton Resort & Club, and just minutes from all of the first-class shopping, dining, entertainment, and nightlife in Downtown Boca Raton. Perfectly positioned in the most coveted part Boca Raton beachfront, One Thousand Ocean is the premier oceanfront address in all of South Florida. If you would like to learn more about One Thousand Ocean or any of the other ultra-luxury condominiums in Boca Raton, FL, please call us at 561-235-7800. You may also provide your information in the brief online contact form below and one of our luxury condo specialists of will promptly reach out to assist you. We at Champagne & Parisi Real Estate look forward to having the opportunity to assist you with all of your Boca Raton luxury condo needs.